On a recent visit to Philadelphia, my first visit actually, I went to the Barnes Foundation to fulfill my art lover’s instinct. The Barnes is a very unique place where art is displayed in the most unusual way. It’s not like when you walk into the Art Institute of Chicago or the MET in New York City, where the art is hung at eye-level, typically with individual works lined up parallel to one another. At the Barnes, the art is displayed in a way that can be overwhelming, as there may be upwards of 100-200 works in a small room, virtually one on top of the other. Furthermore, there are paintings, drawings, metalworks, and pieces of furniture all mixed together, often from very different time periods and of very different subject matters. 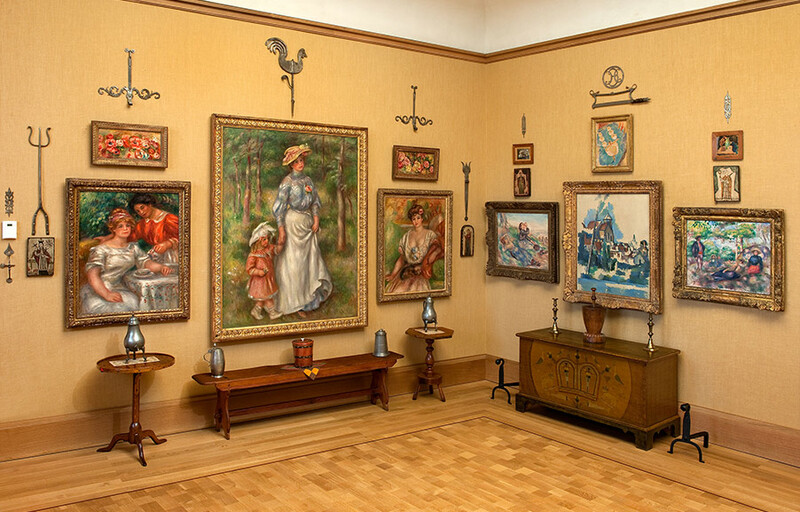 The collector and founder of the museum, Albert C. Barnes, was interested in displaying art according to line, texture, and color rather than according artist, time period, or subject matter. The result – the intriguing experience that is a trip to the Barnes. Not only is the art displayed in an unusual way, there are no didactic labels informing the viewer of the artist, title, or background information. There are, however, booklets in each room that outline what each work is according to a diagram. Referring to the booklets as you browse through the galleries is like embarking upon a scavenger hunt or navigating through a maze. While the booklets are helpful in informing you what the works are, not having didactic labels next to each individual work forces you to evaluate the work based on its aesthetics alone, rather than its prestige and who it’s by. In this way, the works of art are on the same playing field, as opposed to arranged hierarchically based on the artist’s reputation. A visit to the Barnes is essential if you’re ever in Philly, and I definitely plan on going back the next time I find myself there.